Meghan Kellison-Lords is a writer and activist from Pensacola, FL. She is fascinated by the emergence of cryptocurrencies and how they will be used to change the world. Meghan writes for Young Voices (http://youngvoicesadvocates.com/) and Bitcoin Not Bombs (http://www.bitcoinnotbombs.com/), is the office manager at Roberts & Roberts Brokerage, enjoys writing poetry, studying permaculture, and performs as a fire dancer. *This article originally appeared at Bitcoin Not Bombs. With the media frenzy in full tilt after the closing of MtGox, there have been quite a few articles coming out declaring the death of bitcoin and an equal number reassuring us that it will be just fine. I won’t link to the former ones because they’re so painfully uninformed and rely on tired scare tactics. I have come across one article of a different vein, though, and it seeks to bring in thetoxic philosophy of privilege checking as a critique against the Bitcoin community. I could wax philosophic about the specific problems with the academia class developing a divisive practice based on classist, racist, and sexist premises, but I specifically want to address the claims of the author of this piece. There’s no shortage of commenters decrying the inequality of the Bitcoin community from their ivory towers, but to say Bitcoin is “by the privileged, for the privileged” is a new low. The author, Annie Rose-Strasser, claims that Bitcoin is a boy’s club and cites statistics that show men dominate the sphere, but this is neither new nor compelling news. The tech field is dominated by men because more men prefer tech work than women for several reasons, similar to how more women dominate other fields such as nursing and teaching. I’ve argued before thatthese preferences are not a bad thing and believe they represent a natural division of labor that arises when you have a relatively free economy in which people are not forced into specific fields of work. Even though men make up the majority of Bitcoiners they do not work to exclude women, people of color, or those in poverty; in fact, the fastest growing sector of the Bitcoin economy is charities—each of which equally feature women in prominent roles and some of which feature no men on their teams. I am in the unique position of being in one of these myself (Bitcoin Not Bombs) and working closely with the other ones—mainlySean’s Outpost Homeless Outreach,Fr33 Aid, andAntiwar.com. BitGive, Shire Sharing, Bitcoin100, and Good-Bits are other charities/nonprofits that also use bitcoin to help others. Bitcoin100 actually listsdozens more charities that accept bitcoin on their site, and to date the charities I have mentionedhave helped thousands of people locally and globally suffering from poverty whether due to homelessness or natural disasters like the typhoon in the Philippines. 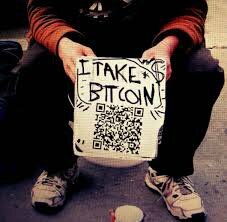 It is no longer a hypothetical theory that bitcoin can be used to help the downtrodden; it is a reality that takes place every day. Sean’s Outpost Homeless Outreach has served over 50,000 meals to homeless residents in Pensacola alone and has bought a nine acre property that will be used as a safe camping space for the homeless, Bitcoin Not Bombs clothed and fed hundreds in their Hoodie the Homeless project, Fr33 Aid sent medical supplies and aid to hundreds afflicted by the typhoon in the Philippines, and Shire Sharing fed over 1,000 people Thanksgiving dinner in New Hampshire. The ability of bitcoin to be sent internationally in a matter of seconds directly to individuals in need for nearly free is ushering a new era of mutual aid and global cooperation. Strasser supplied zero evidence that bitcoin harms the poor, and it is abundantly clear that bitcoin is being used for the very things she claims it isn’t used for. Strasser makes the extremely ignorant assumption that due to this male dominance, Bitcoin users are hostile to the unbanked and other oppressed groups. You would have to be living under a rock feasting solely on anti-Bitcoin propaganda to think that Bitcoin is only about making money and oppressing the lesser privileged. In fact, Bitcoin can help the unbanked more than government agencies. You do not need a driver’s license, bank, or even a place of residence to start using bitcoin. There are homeless people in Pensacola, FL who haveliterally used bitcoin to pull themselves out of poverty—good thing they have their home now so they can check their privilege. After speaking with Jesse, one of the men featured in the Wired story, their biggest hurdle to getting into a home was going through the costly regulations imposed by the state.When you speak with other homeless people in Pensacola, you learn that coding regulations prevent them from living in abandoned buildings and anti-homeless camping bans prevent them from camping on secluded public property. The state is standing in the way of one of the largest unbanked groups gaining financial and physical independence. The anti-homeless camping bans are not unique to Pensacola, and there’s even an actual state representative thatphysically destroys the property of homeless people in Hawaii. The homeless population is being physically oppressed by the very state Strasser argues is necessary for women of color to rise out of their situations. Strasser claims that women comprise the majority of the unbanked and that unregulated financial institutions oppress them. I’m thinking she forgot about how the government she loves so much forced banks to give loans to low income individuals who could not pay them back before the housing crisis. Or, how those predatory banks that stole the income and homes of those same disadvantaged people were then bailed out by the government. But remember that time HSBC executives got jailed for financing Mexican drug cartels who killed about 19,000 people, many of which were women?Oh wait, no, they totally got away with murder. Government in its current form isn’t so much an arm of justice as it is a way to keep those with wealth in power and immune from the laws everyone else is forced to abide by. None of the regulations on the books or proposed are going to stop powerful banking interests from committing crimes on a massive scale because of the licentious relationship between banks, corporations, and government. And how about that drug war that disproportionately jails black men for having the wrong plant? I can’t imagine why there are so many struggling, single mothers who are forced to get assistance just to survive. Good thing state sponsored thugs are there to jail their partners, brothers, fathers, and children. I fail to see how Bitcoin is more threatening than the ineffective, unjust drug war and also how Strasser fails to mention this as an influencing factor in the poverty among women of color. Strasser asks, “Why isn’t the crypto-currency of the future taking hold among communities other than the elite?” Excellent question–bitcoin is. One of the most oppressed groups in this country are Native Americans. The Ogala Lakota Nation, a sovereign Native American tribe, announced interest in Bitcoin specifically because they think it can lift them out of poverty. It’s not really surprising since the government hashistorically persecuted the Lakotas and other tribes. The Lakotas launched the BTC Oyate Initiative Project to raise awareness about Bitcoin and even designed their own cryptocurrency called Mazacoin that is now their official currency. If we really want perspective on privilege, the global implications of an easy to use payment system must be taken into account for its efficiency in providing aid directly to people all over the world—especially disadvantaged women, many of which must raise families on low resources while their partner finds work in more economically healthy areas. The ability for affordable and quick remittances is one of the most promising aspects of Bitcoin. There’s no comparison with Bitcoin and Western Union when it comes to being a cheap, effective money transmitting system. You can’t beat 1% or less transaction fees versus the 12% it takes to send money via Western Union to the poorest parts of Africa. Bitcoin Not Bombs is currently printing Bitcoin quick start guides in Spanish so that people here and across the border can use it to send money to their families back home and avoid high fees. These fees eat up a good portion of what they are able to send to their families back home (and depending on the service, the transaction can be denied), and Bitcoin eliminates these problems. In many cases, being unbanked isa choice made by people who have been historically disenfranchised by banks, and I think it is important not to discount the distrust many still correctly have of banking institutions. Let’s not forget the failure of theFreedman’s Savings Bank, which was set up under Abraham Lincoln. After its failure, depositors–the majority of whom were freed slaves– did not get properly compensated for their losses. I would even say it’s arguable whether the FDIC has the funds to replenish bank deposits in the instance of a modern bank run, but if you trust corrupt banks with your money I guess that’s a risk people are willing to take. Bitcoin doesn’t rely on trusting a third party with your money; its structure forces the individual to be their own bank. While some debate whether that is a flaw or feature, for the unbanked already used to controlling their own money independent of banks it is familiar and easy to transition into. Those “privileged” Bitcoiners are enthusiastic about helping the unbanked get set up with Bitcoin and many spend hours assisting those curious about the protocol and currency. Knowing about the drive, mission, and concern of the individuals in the larger community specifically for the unbanked and less privileged is crucial before you can outright dismiss all Bitcoiners as selfish libertarians twirling their Monopoly man mustaches. The fastest way to get someone started with bitcoin is to help them open a wallet and give them a small amount. I have done this and seen it done numerous times; the community literally gives away money to anyone willing to set up a wallet. Indeed it is how many current Bitcoiners got started. And bitcoin is affordable because you don’t have to buy a whole one at a time, you could buy fractions of a bitcoin depending on your budget. For those unbanked who rely on under the table paid work, Bitcoin is a great way to accept a variety of currencies and actively participate in a new economy–one which rewards bitcoin friendly businesses with consistent patronage. Bitcoin as a payment system/network and as a currency (lowercase b) is also not necessarily trying to replace the current flawed system, as Strasser claims: “Itwants to replace our current economic system and practices in their entirety — changing the way we buy goods and distribute money.” My sides! So, you mean to tell me exchanging a currency for goods and services just like you can with cash, credit cards, PayPal, wire transfers, and checks is replacing the current economic system entirely? Strasser doesn’t appear to have used bitcoin or she would know that it is a currency that functions just like any other method of payment, and sometimes more smoothly with less of a chance to commit fraud and steal from merchants like you can with credit cards. Right now, the Bitcoin economy functions parallel the mixed economy, but issuperior in many ways. It’s unfortunate to see such inaccurate claims about Bitcoin’s ability to rectify societal inequalities because if anything Bitcoin breaks down these barriers erected between individuals by the corrupt banking institutions and government. The entire paradigm of centralized control of finances and aid is shattered when you can send funds directly to someone in need. Millennials are another group that Bitcoin has helped; the fact that these people regardless of race or gender have made some money out of investing early in bitcoin is great news—not something to feel shame over. It’s appalling that Strasser is saying these same people are somehow terrible because they narrowly escaped the financial destitution many in our generation face after going into massive debt for college degrees with little demand in a struggling economy. Bitcoin should be lauded as a success story for the Millennial generation, and while I have not personally made massive gains like some, Bitcoin has helped me secure some financial independence as a female Millennial who was priced out of college and struggled in numerous dead end jobs for years. This is not an uncommon occurrence, my friend Amanda BillyRock talks about how Bitcoin helped her as an unbanked individual in thisthought provoking video. Not all Bitcoiners are wealthy venture capitalists; many are graduates or students faced with crippling debt whose incomes are whittled away by government programs designed to siphon money from the poor and middle classes to older generations. The class implications alone are worthy of considering when talking about Bitcoin’s ability to help the disadvantaged. The Bitcoin world is not all rainbows and roses, and yes you do have to be concerned with criminal elements. The criminals active in Bitcoin are dangerous,but concern over the 0.5% of transactions associated with black market activity is laughable compared to the destruction wreaked by even just one facet of the empire—war; the swiftest way to increase poverty worldwide. For countries torn apart by war, Bitcoin is an excellent way for people outside the conflict to give direct aid and remittances for families who aren’t able to return to their countries (or conversely, escape). This function is really what makes Bitcoin disruptive–it threatens the forces that keep people enslaved by warfare. Strasser is correct in thinking Bitcoin is dangerous; it is dangerous to war profiteers, corrupt banking institutions, unethical banking practices, usurious money transmitting services, tyrannical governments, failed foreign aid programs, and systems that keep people in poverty. Strasser is attempting to force Bitcoin into the mold of social engineers that use buzzwords such as privilege to shame people for doing benign activities like having bitcoins. While shame no doubt has its place for dissuading harmful activities, the privilege argument against Bitcoin is incredibly weak. Privilege is simply defined as a special right, advantage, or immunity granted or available only to a particular person or group of people. Bitcoin cannot possibly be limited to only the privileged as anyone(even people in Kenya) can gain access to it through standard cell phones, a tool which the developing world has increasing access to. I challenge Strasser and others to go beyond the thinking thatBitcoin is bad because white dudes predominantly use it and they are “bad”; it is intellectually lazy and insulting to the thousands of non-white, non-male, non-libertarian human beings that use and benefit from the use of Bitcoin every day. The barriers to entering the Bitcoin economy are lower than getting a bank account or drivers’ license making it an ideal system for the unbanked and impoverished. Social justice advocates would be keen to embrace Bitcoin with open arms as it—in real time not theoretically—is leveling the playing field and providing the most disenfranchised with opportunities previously unavailable.